Bring Fuller Formation Groups to your church or Christian organization and watch your people flourish in their relationship to God and their mission in the world. Fuller Formation Groups are designed to support churches and Christian organizations like yours in your call to serve, strengthen, and grow your people. Each follower of Jesus has a specific calling that is consistent with their created being. When individuals understand their unique role in God’s kingdom and acquire the practices to sustain their vocation, they thrive. When your people thrive, so will the mission of your church or institution. The Fuller Center for Spiritual and Missional Formation honors the diverse contexts and communities that belong to various churches, mission institutions, schools, and denominations nationwide. For this reason, in our church and institutional partnerships we work to understand your unique needs and group culture, so that we can contextualize the customizable elements within our core program, Fuller Formation Groups. Engaging your church, Christian organization, or denomination around a common language and practice to pursue transformation creates a strong common culture to catalyze your mission. We bring the resources, training, and support to deeply engage large numbers of people in a way that refreshes, not taxes, your church or organization. 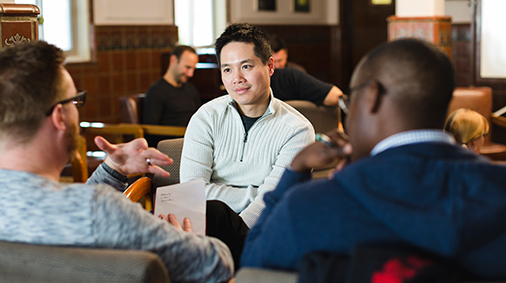 Fuller Formation Groups are built around doctoral research and the work of Fuller's Vocation and Formation department based on spiritual practices that help leaders flourish in Christian mission. Learn more about our research. Invite your church members, staff, or leaders to join a Formation Group and watch the agility and confidence that arise through their clarity of call and deepening relationship to Jesus. "I am amazed at how quickly our group bonded. While most of us did not know each other before, now each retreat feels like a family reunion. I am very grateful for the safe and encouraging space where I can share honestly, where others ‘get’ the joys and challenges of pastoral ministry—and where we are reminded that we, too, are the recipients of God's love and attention, not merely instruments for others."